The fibers from the sympathetic nervous system (SNS) innervate the tissues in almost every organ system. The SNS is best known for mediating the neuronal and hormonal response to stress known as the fight-or-flight response, also known as sympatho-adrenal response. The catecholamine hormones adrenaline and noradrenaline are secreted by the adrenal medulla and facilitate physical activity and mobilize the body to respond to threatening environments. The primary neurotransmitter of SNS postganglionic fibers is noradrenaline, also called norepinephrine. sympathetic nervous system (SNS): One of the three parts of the autonomic nervous system, along with the enteric and parasympathetic systems. Its general action is to mobilize the body’s nervous system fight-or-flight response; it is also constantly active at a basal level to maintain homeostasis. sympatho-adrenal response: Also called the fight-or-flight response, this activates the secretion of adrenaline (epinephrine) and, to a lesser extent, noradrenaline (norepinephrine). stress response: This halts or slows down various processes, such as sexual responses and digestive systems, to focus on the stressor situation; this usually causes negative effects like constipation, anorexia, difficulty urinating, and difficulty maintaining sexual arousal. Physiological changes induced by the sympathetic nervous system include accelerating the heart rate, widening bronchial passages, decreasing motility of the large intestine, dilating the pupils, and causing perspiration. Alongside the other two components of the autonomic nervous system, the sympathetic nervous system aids in the control of most of the body’s internal organs. Stress—as in the hyperarousal of the flight-or-fight response—is thought to counteract the parasympathetic system, which generally works to promote maintenance of the body at rest. Sympathetic nervous system: The sympathetic nervous system extends from the thoracic to lumbar vertebrae and has connections with the thoracic, abdominal aortic, and pelvic plexuses. The sympathetic nervous system is responsible for regulating many homeostatic mechanisms in living organisms. Fibers from the SNS innervate tissues in almost every organ system and provide physiological regulation over diverse body processes including pupil diameter, gut motility (movement), and urinary output. The SNS is perhaps best known for mediating the neuronal and hormonal stress response commonly known as the fight-or-flight response, also known as sympatho-adrenal response of the body. This occurs as the preganglionic sympathetic fibers that end in the adrenal medulla secrete acetylcholine, which activates the secretion of adrenaline (epinephrine), and to a lesser extent noradrenaline (norepinephrine). Therefore, this response is mediated directly via impulses transmitted through the sympathetic nervous system, and also indirectly via catecholamines that are secreted from the adrenal medulla, and acts primarily on the cardiovascular system. Messages travel through the SNS in a bidirectional flow. Efferent messages can trigger simultaneous changes in different parts of the body. For example, the sympathetic nervous system can accelerate heart rate, widen bronchial passages, decrease motility of the large intestine, constrict blood vessels, increase peristalsis in the esophagus, cause pupillary dilation, piloerection (goose bumps) and perspiration (sweating), and raise blood pressure. Afferent messages carry sensations such as heat, cold, or pain. Some evolutionary theorists suggest that the sympathetic nervous system operated in early organisms to maintain survival since the sympathetic nervous system is responsible for priming the body for action. One example of this priming is in the moments before waking, in which sympathetic outflow spontaneously increases in preparation for activity. The fight-or-flight response was first described by Walter Bradford Cannon. His theory states that animals react to threats with a general discharge of the sympathetic nervous system, priming the animal for fighting or fleeing. This response was later recognized as the first stage of a general adaptation syndrome that regulates stress responses among vertebrates and other organisms. Acceleration of heart and lung action. Paling or flushing, or alternating between both. Inhibition of stomach and upper-intestinal action to the point where digestion slows down or stops. General effect on the sphincters of the body. Constriction of blood vessels in many parts of the body. Liberation of nutrients (particularly fat and glucose) for muscular action. Dilation of blood vessels for muscles. Inhibition of the lacrimal gland (responsible for tear production) and salivation. Auditory exclusion (loss of hearing). Tunnel vision (loss of peripheral vision). Disinhibition of spinal reflexes; and shaking. In prehistoric times, the human fight-or-flight response manifested fight as aggressive, combative behavior and flight as fleeing potentially threatening situations, such as being confronted by a predator. In current times, these responses persist, but fight-and-flight responses have assumed a wider range of behaviors. For example, the fight response may be manifested in angry, argumentative behavior, and the flight response may be manifested through social withdrawal, substance abuse, and even television viewing. Males and females tend to deal with stressful situations differently. Males are more likely to respond to an emergency situation with aggression (fight), while females are more likely to flee (flight), turn to others for help, or attempt to defuse the situation (tend and befriend). During stressful times, a mother is especially likely to show protective responses toward her offspring and affiliate with others for shared social responses to threats. The parasympathetic nervous system regulates organ and gland functions during rest and is considered a slowly activated, dampening system. Body functions stimulated by the parasympathetic nervous system (PSNS) include sexual arousal, salivation, lacrimation, urination, digestion, and defecation. The PSNS primarily uses acetylcholine as its neurotransmitter. Peptides (such as cholecystokinin) may also act on the PSNS as neurotransmitters. acetylcholine: An organic, polyatomic cation (often abbreviated ACh) that acts as a neurotransmitter in both the peripheral nervous system (PNS) and central nervous system (CNS) in many organisms, including humans. parasympathetic nervous system: One of the divisions of the autonomic nervous system, based between the brain and the spinal cord, that slows the heart and relaxes muscles. The parasympathetic nervous system (PSNS, or occasionally PNS) is one of the two main divisions of the autonomic nervous system (ANS). 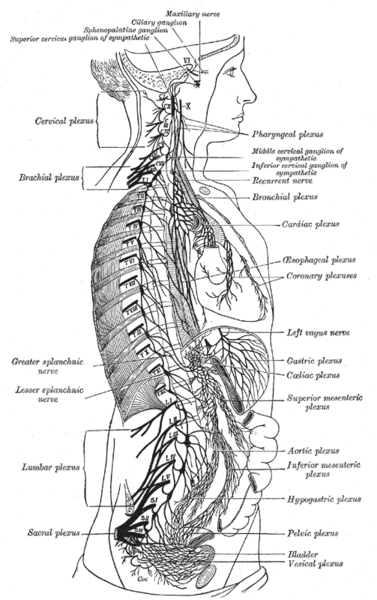 The autonomic nervous system (ANS, or visceral nervous system, or involuntary nervous system) is the part of the peripheral nervous system that acts as a control system, functioning largely below the level of consciousness and controlling visceral functions. The ANS is responsible for regulating the internal organs and glands, which occurs unconsciously. Its roles include stimulation of rest-and-digest activities that occur when the body is at rest, including sexual arousal, salivation, lacrimation (tears), urination, digestion, and defecation. Its action is described as being complementary to that of one of the other main branches of the ANS, the sympathetic nervous system, which is responsible for stimulating activities associated with the fight-or-flight response. The sympathetic and parasympathetic divisions typically function in opposition to each other. This natural opposition is better understood as complementary in nature rather than antagonistic. The sympathetic nervous system can be considered a quick response, mobilizing system; and the parasympathetic system is a more slowly activated, dampening system. A useful acronym to summarize the functions of the parasympathetic nervous system is SLUDD (salivation, lacrimation, urination, digestion, and defecation). 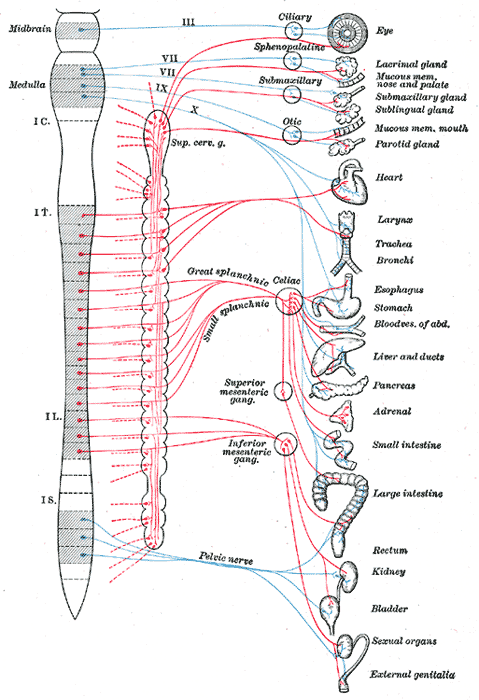 The parasympathetic nervous system may also be known as the parasympathetic division. The parasympathetic nervous system uses chiefly acetylcholine (ACh) as its neurotransmitter, although peptides (such as cholecystokinin) may act on the PSNS as neurotransmitters. The ACh acts on two types of receptors, the muscarinic and nicotinic cholinergic receptors. Most transmission occurs in two stages. When stimulated, the preganglionic nerve releases ACh at the ganglion, which acts on nicotinic receptors of the postganglionic neurons. The postganglionic nerve then releases ACh to stimulate the muscarinic receptors of the target organ. Nicotinic acetylcholine receptors: Two different subtypes of nicotinic acetylcholine receptors with alpha and beta subunits are shown. The acetylcholine binding sites are indicated by ACh. The sympathetic and parasympathetic autonomic nervous systems cooperatively modulate internal physiology to maintain homeostasis. The sympathetic and parasympathetic divisions typically function in opposition to each other, with one division exciting, triggering, or activating a response that is countered by the alternate system, which serves to relax, decrease, or negatively modulate a process. The sympathetic division typically functions in actions requiring quick responses. The parasympathetic division functions with actions that do not require immediate reaction. The sympathetic division initiates the fight-or-flight response and the parasympathetic initiates the rest-and-digest or feed-and-breed responses. The sympathetic and parasympathetic nervous systems are important for modulating many vital functions, including respiration and cardiac contractility. For example, the activities of both the sympathetic and parasympathetic systems maintains adequate blood pressure, vagal tone, and heart rate. feed-and-breed: The parasympathetic nervous system is often colloquially described as the feed-and-breed or rest-and-digest portion of the autonomic nervous system. vital function: A measure of various physiological states that life depends on, such as recording body temperature, pulse rate (or heart rate), blood pressure, and respiratory rate. Some processes that are modulated by the sympathetic and parasympathetic systems but that are not easily labeled as fight or rest include the maintenance of blood pressure when standing and the maintenance of regular heart rhythms. Sympathetic and parasympathetic divisions typically function in opposition to each other. However, this opposition is better termed complementary in nature rather than antagonistic. For an analogy, one may think of the sympathetic division as the accelerator and the parasympathetic division as the brake. The sympathetic division typically functions in actions requiring quick responses. The parasympathetic division functions with actions that do not require immediate reaction. Consider sympathetic as fight or flight and parasympathetic as rest and digest or feed and breed. The subdivisions of the autonomic nervous system: In the autonomic nervous system, preganglionic neurons connect the CNS to the ganglion. However, many instances of sympathetic and parasympathetic activity cannot be ascribed to fight or rest situations. For example, standing up from a reclining or sitting position would entail an unsustainable drop in blood pressure if not for a compensatory increase in the arterial sympathetic tonus. Another example is the constant, second-to-second modulation of heart rate by sympathetic and parasympathetic influences, as a function of the respiratory cycles. More generally, these two systems should be seen as permanently modulating vital functions, usually in an antagonistic fashion, to achieve homeostasis. Some typical actions of the sympathetic and parasympathetic systems are listed below. Blood flow to skeletal muscles and the lungs is enhanced (by as much as 1,200% in the case of skeletal muscles). Dilates pupils and relaxes the ciliary muscle to the lens, allowing more light to enter the eye and far vision. Provides vasodilation for the coronary vessels of the heart. Constricts all the intestinal sphincters and the urinary sphincter. Dilates blood vessels leading to the GI tract, increasing blood flow. Constricts the bronchiolar diameter when the need for oxygen has diminished. Causes constriction of the pupil and contraction of the ciliary muscle to the lens, allowing for closer vision. Stimulates salivary gland secretion, and accelerates peristalsis. The medulla oblongata, in the lower half of the brainstem, is the control center of the autonomic nervous system. The medulla contains the cardiac, respiratory, and vasomotor centers. The ANS is classically divided into two subdivisions, the sympathetic division and the parasympathetic division. As a rule, the SNS functions in actions that require quick responses, while the PSNS is initiated in actions that don’t require immediate response. fight or flight: This theory states that animals react to threats with a general discharge of the sympathetic nervous system, priming the animal for fighting or fleeing. The autonomic nervous system (ANS) is the part of the peripheral nervous system that controls involuntary functions that are critical for survival. The ANS participates in the regulation of heart rate, digestion, respiratory rate, pupil dilation, and sexual arousal, among other bodily processes. Within the brain, the ANS is located in the medulla oblongata in the lower brainstem. The medulla’s main functions are to control the cardiac, respiratory, and vasomotor centers, to mediate autonomic, involuntary functions, such as breathing, heart rate, and blood pressure, and to regulate reflex actions such as coughing, sneezing, vomiting, and swallowing. The brain stem with pituitary and pineal glands: The medulla is a subregion of the brainstem and is a major control center for the autonomic nervous system. The hypothalamus acts to integrate autonomic functions and receives autonomic regulatory feedback from the limbic system to do so. The ANS is classically divided into two subdivisions, the sympathetic division and the parasympathetic division. The sympathetic division of the ANS is often referred to as the sympathetic nervous system (SNS). The SNS provides noradrenergic drive to the ANS. It is often referred to as a quick response mobilizing system that initiates the body’s fight-or-flight response. PSNS input to the ANS is responsible for the stimulation of feed-and-breed and rest-and-digest responses, as opposed to the fight-or-flight response initiated by the SNS. The parasympathetic division of the ANS (PSNS) acts to complement and modulate the drive provided by SNS neurotransmission within the ANS. As a rule, the SNS functions in actions requiring quick responses while the PSNS is initiated in actions that don’t require immediate response.